This happened today and may be of use to other Ubuntu or Debian users with a similar configuration. The disk of a laptop lost its partition table because it was mistaken for a USB key and modified. There was no way to recover the old GPT partition table from the backup because it was not corrupted. The new partition table was both in the GPT partition table and its backup. The partition table is rebuilt to start with a 512MB partition for EFI (type 1) followed by another parition for the rest of the disk. When the second partition table is created using fdisk, it will issue a warning about an ext2 signature: it must be preserved. Note: for some reason fdisk adds 1 to the specified number of sectors in some cases. Care must be taken to verify the actual number of sectors allocated to the partition and adjust them accordingly. The signature of the third partition gives a hint regarding its content. If it is crypto_LUKS, it can be open with cryptsetup luksOpen /dev/nvme0n1p3 root and the device will show under /dev/mapper. Today I permanently deleted the GitHub account that was in my name. I used it to contribute to Free Software projects that only use this proprietary platform. I started using GitHub a few years ago and constantly tried (and failed) to convince projects to self-host using Free Software instead. As more and more Free Software projects I care about moved to GitHub, I ended up using it daily and it made me sad. By using Microsoft services daily, I would also implicitly support them, even if indirectly. I feel better knowing I no longer depend on Microsoft in any way. The Docker test container can be modified to run on /opt/nextcloud/server, a clone of the Nextcloud server including the generated app. PHPUnit 5.7.27 by Sebastian Bergmann and contributors. 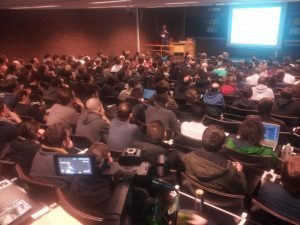 Only this year did I fully understand what motivates so many people to devote their free time to making FOSDEM a success, year after year. As surprising as it sounds, organizing the privacy devroom and standing at the booth was better than just visiting, chatting and attending talks. A big part of that good feeling certainly comes from the excellent organization. Accidents happened, of course, but they were resolved quickly. And ancient Free Software was used with clunky interfaces but nothing got in the way and people used to it help the newcomers. As a Free Software developer, this sets a fine example of the feeling we would like to provide to every contributor of our code base. When participating is more enjoyable than passively using, we’re one step closer to contributopia. The git-log -L option traces the evolution of the line range given by “<start>,<end>” and it is not really convenient to use from the command line. Fortunately when the magit-file-mode is active in an emacs buffer, you can select a region and use C-c M-g l to show which commits modified it. Using a mobile anonymously with encrypted messages and voice is challenging. With Signal text and voice are encrypted but it sends your contacts to Signal which makes me uncomfortable. With Orfox you can browse the web without revealing your IP address but the GSM module tracks your location. With a small budget you can however buy a second hand mobile and dedicate it to anonymous communications, as long as you remove its battery when you’re not in a public place. You do not leak your contacts to Signal and the GSM module tracks a SIM card that is not associated with you. Here is a detailed description of the preparation of an anonymous phone I did today. This is not rocket science and I’m sure lots of people already know all of that. But I did not find a HOWTO and it took me some time to figure it out. The goal is to configure a nginx server with automatic Let’s Encrypt renewal, assuming a new dedicated virtual machine running a pristine Debian GNU/Linux stretch/9. and run docker-compose up in the same directory as the docker-compose.yml file. The default Tails 3.0 bootable ISO includes proprietary binary blobs running on network hardware. They may contain backdoors and are silently loaded when Tails boots. There is no known exploit at this date but it may take years before they are discovered. To remove this security and privacy risk, a new ISO can be built using a pristine Debian GNU/Linux 9 / stretch installation. The *.iso file can then be installed.